The water level on Ma River continues rising quickly causing the flooding in many areas of Thieu Duong Commune in the central province of Thanh Hoa. 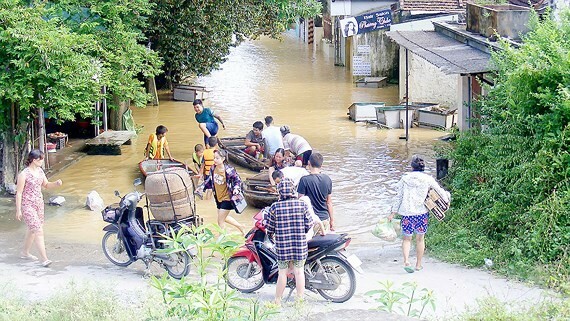 The latest information from Thanh Hoa province committee for natural disaster prevention and control said the flooding in the past days caused 3 missing and 123 houses destroyed completely. Landslides damaged 49 houses while over 4,000 houses flooded, 963 hectares of rice crops and 193 hectares of vegetables were submerged. In the central province of Nghe An, the rising water level on Lam River destroyed the road stretching to Chom Lom bridge in Lang Khe Commune, Con Cuong District. 500 households in Chom Lom, Dong Tien, Yen Hoa villages were isolated by the floods. Nghe An province People’s Committee sent urgent dispatch to the departments, authorities, localities to overcome the complex flooding situation. 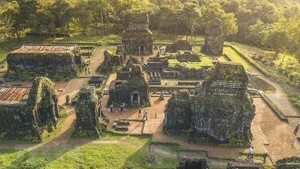 According to the provincial committee for natural disaster prevention and control, the mountainous districts including Tuong Duong, Ky Son, Con Cuong were effected directly by the flooding and heavy rains from August 30 to 31. Of these, 10 houses in Tuong Duong district were swept away by the flooding; 37 houses were moved out of the dangerous zone; 4 houses were collapsed. In Con Cuong district, local authority moved 52 houses out of dangerous areas while 82 houses in Ky Son were flooded. Many main routes linking the national road No.7 to the mountainous areas were seriously damaged.